It features a blend of 3D hyaluronic acid, hyaluronic acid and Resveratrol EX to retain water contents in the skin; moisturize; nourish and firm up your skin. There are 4 types of Hyaluronic acid in the product: 3D hyaluronic acid, hyaluronic acid, super hyaluronic acid and nano hyaluronic acid to deliver exceptional anti-aging results on a daily basis. As a regime, the gel will lift, firm and hydrate to visibly reveal younger looking skin. 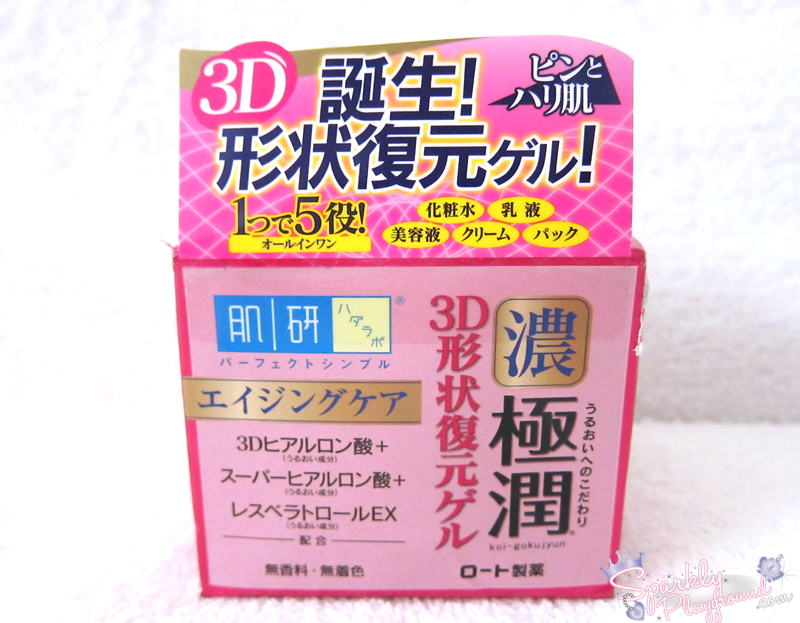 It is a 3D shape reconstruction gel that will be restored quickly once you make contact with it. See the super cool video clip and commercial here to see what I mean by that! It is suggested to be used after cleansing your face because it is a multi-function product that allows you to complete your skin care routine in one step. Water, glycerin, pentylene glycol, PPG-10 methyl glucose ether, PEG-240/HDI copolymer bis-decyltetradeceth-20 ether, sodium hyaluronate crosspolymer, sodium acetylated hyaluronate, hydrolyzed sodium hyaluronate, hyaluronic acid, disodium EDTA, polysorbate 60, phenoxyethanol, resveratrol, gnetum gnemon seed extract, dextrin, beheneth-30, sodium citrate, citric acid, ammonium acrylates copolymer, methylparaben. It's been almost a year since I purchase this product during my Japan Tokyo trip in October 2013! At the time it was recently launched and the product display was SUPER cool so I had to purchase it! 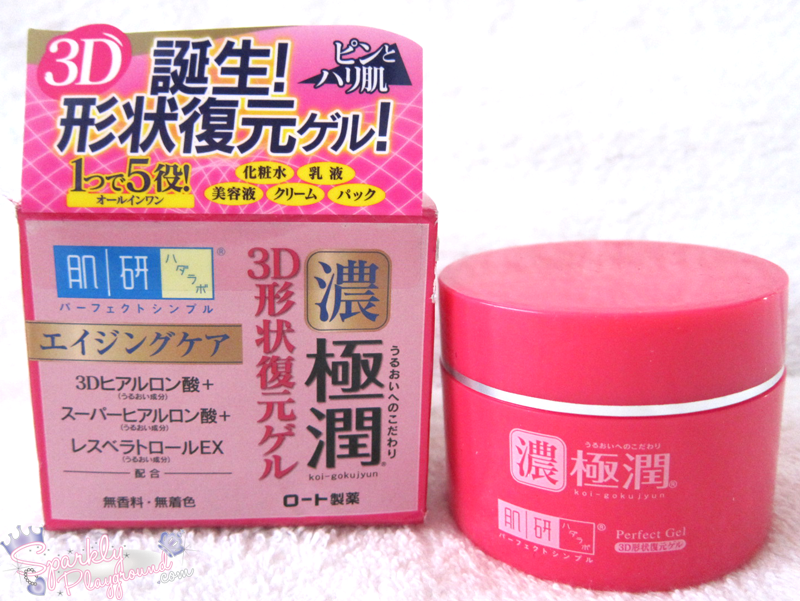 It is one of the 5 Gokujun products in the range, actually I tried this one before I purchased the UV White Gel one which was reviewed previously. Starting with the packaging, just like the UV White Gel, it is secured with their packaging so you know right away whether it has been opened or not. Love it! This is one of the coolest features and I think at the time (last year), it was ground-breaking in the beauty industry. Notice the above picture, even if you dig through it, it goes back to original state! Super cool! I use it after washing my face, after applying toner/lotion to my face. I use it day and night and it's extremely moisturizing!!! 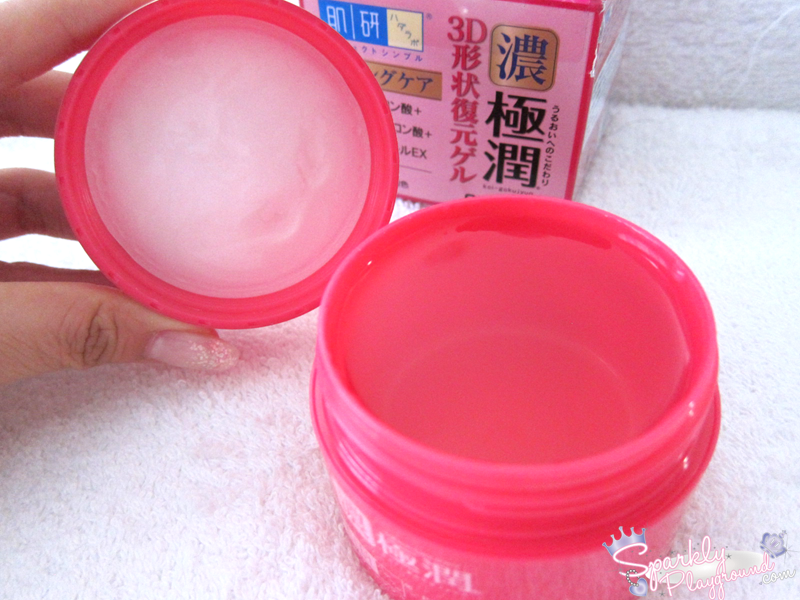 It feels like jelly at first, but then it like melts like a gel texture. When applied to face, it feels like I'm mushing jello onto my skin. After massaging it into my skin, it's super moisturizing. It leaves a sticky residue and it eventually feels like a very moisturized skin texture. For the rest of the day, my skin have a very healthy glow. I have no rubbery residue so it made it perfect to apply under make up. Product: 5/5 ♥ Love it! Super moisturizing, noticed some fine lines missing already. Great for dry seasons!